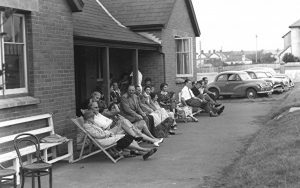 The Club was formed in July 1946 by a group of friends and enthusiasts who had formerly played on a’pay and play’ basis on the Council awned courts in Golf Links Road, Westward Ho! Agreements with Northam Urban District Council were held leasing the courts for various lengths of lease ranging from one to three years. This situation was not satisfactory, and the general consensus of opinion of members was that should ever the opportunity arise the Club should make intensive efforts to prepare a development scheme for the future of the Club. By the overwhelming generosity of the owner, a plot of land in Avon Lane was made available on a freehold basis providing it was used for the specific purpose of tennis courts and pavilion. This offer was gratefully accepted (September 1972) and work on the pavilion commenced almost immediately. The contract for the courts was placed with En-Tout-Cas to be completed by September 1973. As funds available were scarce the estimates for the proposed pavilion were far too high and careful consideration was given on how this could be achieved. By a stroke of luck, a member Mr. Herbert Geen, who was a retired builder, came forward and volunteered to undertake this task. This was gratefully accepted and this gigantic task was undertaken almost single handed by Herbie Geen. The Club terminated their lease with Northam Urban District Council and moved to their new home in May 1974. It has always been the Club policy to encourage junior members and regular evenings are set aside for the young members to play. BY natural progression juniors are then offered full playing membership. The Club hosts the Torridge School of Tennis which promotes the coachin g side of the sport and the furtherance of tennis in the area. Again valuable recruitment from this source. During 1984,the solicitors on behalf of the exors of Mrs. D. Knowles stated that they were willing to release the Club of their obligations to offer the land back to the exors in accordance with the terms of the deeds. The offer of extinguishing the right of pre exemption ,in the conveyance of November 1912 was accepted by the Club, and a payment of £1,000 was made to the exors to release the Club from the restricted covenant. During 1986 the courts were relaid by Messrs. Courtstall supported by L.T.A. loan, Sports Council grant and local Bridge Trust grant. Work completed by November. Unfortunately some macadam provided was defective and during May 1987 the courts were relaid free of charge. Although the land to the south of the Club was to be developed by the exors, the Club were not willing to consider any offer to relocate to a new site (no definite offer received) and therefore would uphold the original covenant as’desired by the late Mrs. Knowles. To enhance the Club facilities it was decided to install floodlights on two courts. Preliminary work was started at the end of 1990 and the lights were in operation early the following year, opened by the County Chairman. Again, covered cost of approximately £13,000 by L.T.A. loan, Sports Council grant, etc. This facility has helped considerably all year round play, incorporating North Devon League (local clubs invited), Junior Squad coaching as well as general club play. The Club over the years has enjoyed many successes entering mens and ladies teams in the North Devon League, winning both Mens and Ladies League and Cup competitions on many occasions as well as the Houldsworth Cup. An annual ratings tournament, recognised by the L.T.A., was started in May 1988 and has run successfully over the past eleven years. During 1992 the Club was successful in reaching the regional finals of the national Silk Cut competition. The Club has also hosted major county events and the courts are used regularly by the North Devon Junior Squad for training. During June 1994 a 25 hour tennis marathon was played on the Club courts to celebrate 25 years of the North Devon League. Through various forms of sponsorship £1.000 was donated to Tennis for the Disabled. Charity tournaments are also played. Whilst tennis is the obvious priority, the social side is not neglected. A bridge section was started in 1982 and has been an important section of the Club ever since. Teams are competing in the local skittles leagues and other regular events such as quiz evenings, sponsored walks and dances are organised. The 50th anniversary of the Club was celebrated during 1996 and an intensive and interesting programme was arranged for this celebration. Recently proposals were received to investigate the setting up of indoor courts but advice from the L.T.A. that they were unable to support such a major project until the proposed indoor centre at Barnstaple was up and going. An alternative to this scheme would be to support the project proposed at Edgehill College and a feasibility study group was set up to look into this plan but to date no definite offers are forthcoming. 2007 there are plans to move the club to another site, the present one will be sold off for building land. 2015 The site has now been sold and new Tennis Courts built at Caddesdown.